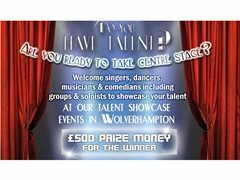 The wait is finally over-Starztalent: Showcase 4 returns in August and will be held at our new location in Wolverhampton on the 3rd Saturday in each month. We are looking for talented performers (singers, dancers & musicians) to perform and compete in our monthly Talent Showcases for Judges and Audience votes. The winner and runner up from each monthly showcase event (August to November) will go on to perform in our Grand Showcase Final in December and compete to win £500 prize money. Suitable for talented performers (singers, dancers & musicians) who need the opportunity to showcase their gift, develop and grow in confidence. In our Grand Final in December the winner will receive prize money of £500!